There are a number of special applications where one needs distilled water such as keeping the sponge for your soldering iron wet, ironing shirts or re-filling car batteries (non sealed car batteries without a platinum sponge). Many people buy distilled water and don't realize that they could have it for free. If you have an air conditioning in your house then you have distilled water. The AC has a drain pipe somewhere and therefore we are not really aware of the distilled water that is beeing produced but it's a lot of water. A central air conditioning for a 3 to 4 bedroom house produces on a warm summer day about 20 Liter (5 Gallon) of distilled water. That's a lot of distilled water every day. So here is how to harvest the distilled water. It works best with ceneral air conditioning systems. Compact window mounted units are often constructed such that the water accumulated in condenser flows onto the hot outside parts of the AC where it evaporates. You don't get a lot of water from those units unless you open them. If you have a ceneral air conditioning in your house then make sure you insert a new fine dust filter into the air-intake shaft. You don't want to have dust particles in the water. Most window mounted single room ACs don't have dust filters but you can get rid of dust particles by running the water afterwards through a coffee filter. Located the pipe where the water flows out of your AC's condenser. Connect a little hose and collect the water in a bucket. Now you have distilled water. It's completely free from salts and minerals but it is full of living microbes found in normal room air. Fill the water into a pot and boil it to for a minute to get rid of the living microbes. It's high quality distilled water and it's really distilled (that is: made by condensing water vapor). 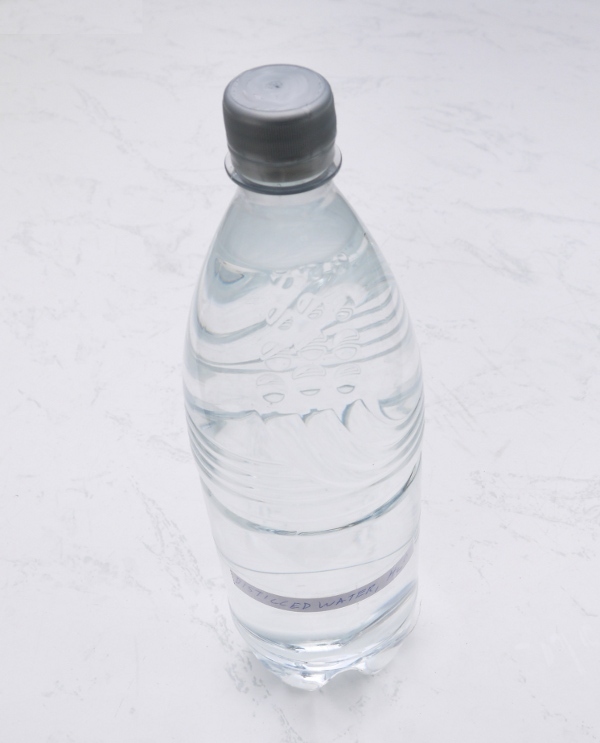 Most distilled water sold in the shops is not actually distilled. It is generated by running tap water through an ion exchanger.